Louis Tarlo, who has died aged 96, represented Great Britain in the first World Championship for the Bermuda Bowl. This was held in Bermuda in 1950 with Britain finishing third. Earlier that year, Tarlo played in the European Championship. 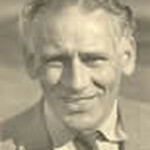 Louis Tarlo represented Britain in seven more European Championships collecting two bronze medals. He first represented England in the Home Internationals for the Camrose Trophy in two matches before the Second World War. Of 22 England caps the last came in 1975, some 36 years later, partnering Chris Dixon. Tarlo won the Gold Cup, the British knockout championship, on five occasions starting in 1939 and finishing in 1974 when he was aged 62. In 1961 he suffered the annoyance of losing to his brother in the final. Over two decades Tarlo was non-playing captain of British teams that collected one silver and two bronzes in World Championships. In this role in the Europeans he collected two golds and three silvers. Tarlo was a Chairman of the English Bridge Union and later a Vice President. He also won the Gold Award. He was a solicitor, married to Bea, who predeceased him. Peter Stocken, Chairman remembers Louis well, " He was one of the greats of the British bridge scene during its golden years. He also worked incredibly hard over many years for the EBU. He was only Chairman for a year in 1951/2, but he was one of the very few people ever to be awarded the EBU's Gold Award for outstanding service. He was the EBU's Honorary Solicitor until the early 1990s. "